Are you in need of adventure? Do you want to visit distant, exotic lands? Are you convinced that you have an ultimate destiny? 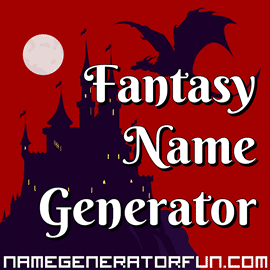 If so, then it's time to voyage to strange and unusual places with our fantasy name generators! Are you the seventh youngest son of a seventh youngest son? Were you swapped at birth by the fairies? Do you have an unusual birth mark? Did your mother get into a tight spot and make a deal with a wicked fairy in exchange for her first born child? If so, you've come to the right place! You have the chance here to either create a random alter ego, or one that's uniquely generated from your own first and last name. You can choose male or female fantasy names, and you will also get a description of your strange adventures, including where you originally hailed from, and the curious things that happen to you on your journey! It's ideal if you're looking for a new character for a tabletop RPG, a screen name for a online game, or just to add a little wonder and magic to your day! Either way, we hope you like our fantasy names! There are a few fantasy generators around already, but we couldn't find one that gave the option to create both random names, and names unique to the user of the generator. Many are very serious and create gobbledegook words. With this page, we aimed to create magical names that were easy to remember and that conjured up romantic images, with many first names based on old Celtic names, second names based on real words, interesting social titles, and descriptions of mysterious and inspiring far off places that sound like they are from fairy tales. If you liked this page, you might also like our names for fairies and Sindarin elves. Last Updated: 11th February 2019. Image Credit: Castle with dragon adapted from a design by Freepik.